This collection of essays by different authors is presented as a tribute to Walter B. “Buddy” Shurden, (distinctively Baptist) church historian, teacher, preacher, author, Baptist apologist extraordinaire. 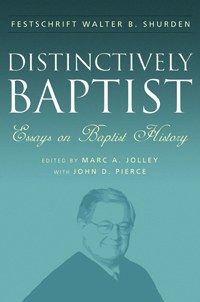 The rationale of this celebration of the lifework and influence of Walter Shurden is well stated, for example, in editor Marc Jolley’s preface: "[D]uring some of the initial forays of our most-recent and ongoing Fundamentalist-Moderate controversy, there were days when I thought about changing denominations. Shurden’s works were instrumental in my remaining a Baptist, not because I could see how Baptists had always had controversies and survived--although that is true--but because he helped me understand that the reason I had been Baptist and would remain so was due to our Baptist distinctives, our freedoms. For so much more, but especially for that understanding, I am forever grateful." Many students, Baptists in the pews, some at the pulpit or lectern, even some who are not "distinctively Baptist" could testify in like terms regarding the ongoing work and influence of Walter B. Shurden. The essays in this collection of course address some of the primary concerns of Walter Shurden, augmenting that already significant lifework. Contributors: William L. Blevins, Bill J. Leonard, E. Glenn Hinson, Edwin Gaustad, William Brackney, Charles W. Deweese, Douglas Weaver, Glenn Jonas, Merrill M. Hawkins, Jr., Robert N. Nash, Jr., Karen Smith, Wm. Loyd Allen, Pam Durso, Carolyn DeArmond Blevins, William Hull, Edmon L. Rowell, Jr., John D. Pierce, and Marc A. Jolley.